The mother of a newborn baby who died in her arms aged 12 hours, said what should have been the happiest day of her life turned into the worst day of her life. 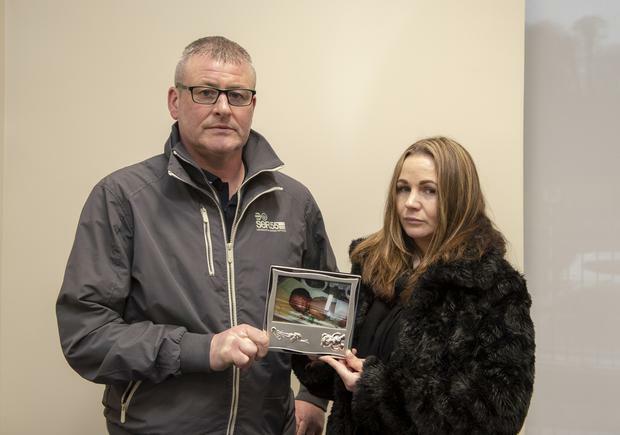 Fiona Tuite and Ivan Murphy, from Drogheda, county Louth, as well as other family and friends, were at the inquest into the death of their son Evan at Drogheda Coroner’s court today. A verdict of medical misadventure was returned and the inquest heard how there were six attempts made using either a forceps or vacuum to deliver the baby. Last year the High Court heard he suffered a fractured skull and a significant brain injury. Baby Evan died some 12 hours later in his mother’s arms. After her deposition, or statement, was read out during the inquest, Fiona said she wanted to say something else. It is just over a year since Our Lady of Lourdes Hospital in Drogheda apologised to Evan’s parents after a High Court action. The High Court had heard the circumstances of his delivery in June 2012 were “quite horrific”. The hospital denied liability until November 2017 last year. Today, the inquest heard that the cause of death was severe external and internal cranial and brain injury and haemorrhage due to a difficult instrumental delivery. Ms Sara Antoniotti BL, for the family, said she believed the appropriate verdict was one of medical misadventure. She said there were six different pulls on the baby’s cranium as he was being delivered. The inquest heard the baby was due on the 1st June 2012 and Fiona was induced on the 13th June. After an 11 hour labour it was decided to use a forceps to deliver him. Between 6.16 am and 6.29am, the doctor used a forceps, then the vacuum cup and then the forceps again to deliver the baby. He was born at 06.29 and taken to the special care unit. At 10.30 am he had to be resuscitated and the inquest heard he died that evening, some 12 hours after birth. Returning the verdict of medical misadventure Coroner Ronan Maguire expressed his heartfelt sympathies to the parents and it was a very difficult time for them. Speaking afterwards Fiona Tuite said the inquest confirmed what she and Ivan already knew. She said she had a “textbook pregnancy, I flew through the pregnancy”. She said the couple had everything ready for their son. “The nursery was ready, the clothes were ready,” she said.